I have looked at this picture so many times and each time I just burst out laughing. Not just at the mere sight of a police officer holding 2 pounds and over 2 feet of pot. Also at how positively giddy the tank-top wearing spectator is. I bet he totally had the giggles, brah. 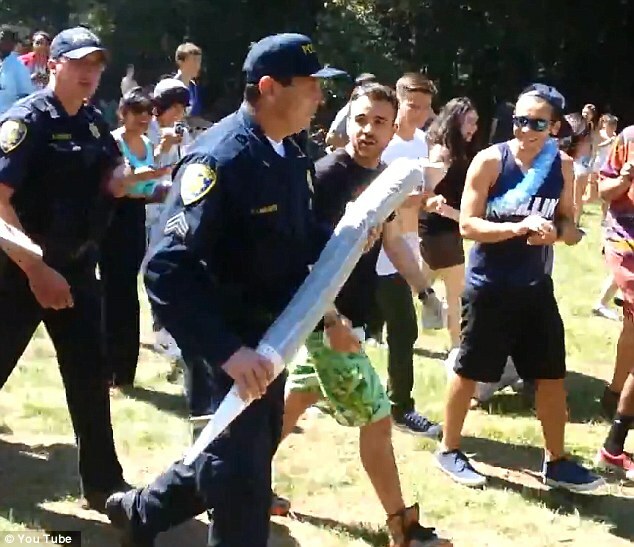 "According to a report from KTVU on April 21, the incident happened on April 20, or 4/20, which is a day to identify oneself with the marijuana subculture." It sounds like the person who wrote this article might have also "identified oneself" with the day in question. I don't know what they did with the evidence, but whoever took care of it probably also needed to confiscate like 400 bags of Doritos. If you do click on this article, which I suggest you do, please read the comments. There are some gems in there.